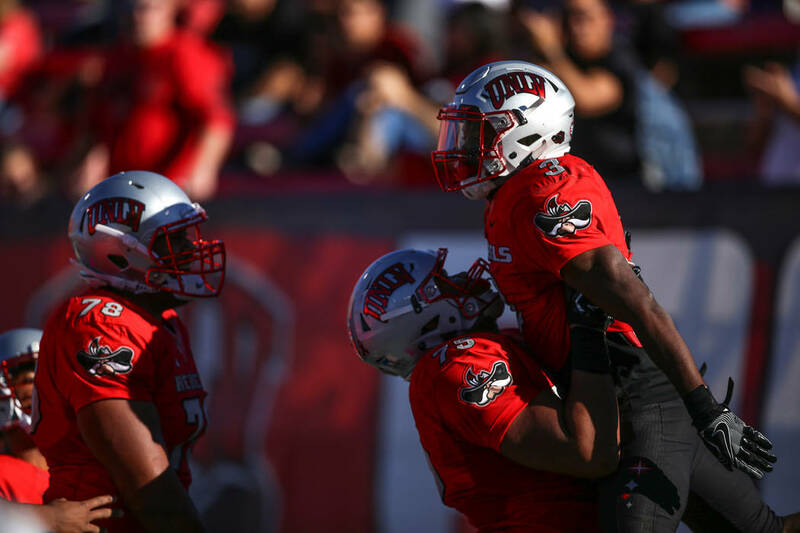 There are several position battles taking place during UNLV’s football training camp. Three offensive line positions, in particular, are up for grabs. Much of UNLV’s competition is for playing time and rotation spots, but there are some battles for starting jobs. UNLV completed its first week of training camp Thursday at Rebel Park in preparation for the football season, which begins Sept. 1 at Southern California. — Junior Jaron Caldwell could start at offensive left tackle or left guard, competing against sophomore Donovan Outlaw at tackle and senior Zack Singer at guard. Singer also is in competition with junior Sid Acosta at center. — Senior Jameer Outsey has been running first team at defensive end over junior Nick Dehdashtian, but coach Tony Sanchez said they are expected to share snaps. — At nose tackle, freshman Chris Manoa took advantage of sophomore Kolo Uasike’s nearly week-long absence due to weight-loss issues. Uasike is expected back Friday, heating up the competition. — Senior Bailey Laolagi has the flexibility to play multiple linebacker spots, and he is pushing junior Gabe McCoy at weakside and sophomore Farrell Hester II in the middle. — Senior Jocquez Kalili and junior Jericho Flowers have been the No. 1 cornerbacks, but the Rebels are hopeful sophomore Alex Perry will be ruled eligible for this season by the NCAA. Perry transferred from Arizona State and would be expected to make an immediate impact. “It’s the first time we’ve come into camp and we’ve got so many guys that are capable of helping us out that (starters have) got to bring it every single day because somebody will take their job,” Sanchez said. — Junior right guard Justin Polu was named to the watch list for the Polynesian College Football Player of the Year award. Polu, a Silverado High School product, started all 24 games the past two seasons. He was limited in practice Thursday because of a gout problem. — Dehdashtian didn’t practice because of an injured foot, but Sanchez said he wasn’t seriously hurt. — Sanchez bemoaned the number of dropped passes Thursday, and the defense got in some extra work after practice.